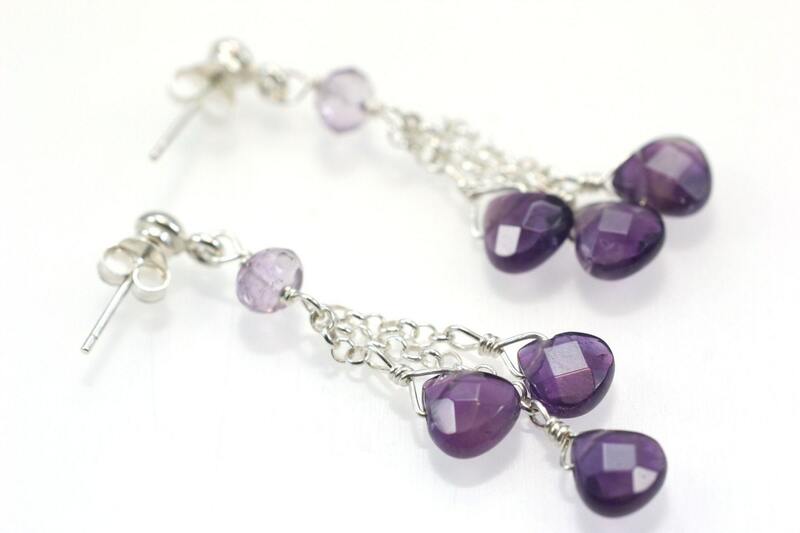 A beautiful medley of Amethyst Briollettes all hand-wired onto Sterling Silver chain. The stunning triple strand dangling earrings are finished with Sterling Silver ear studs. All items will be shipped to you in a beautiful white gift box and finished with a pink ribbon. We do ship orders outside of the US, please contact us for shipping rates. Please note, NJ residents will be charged the current sales tax rate at checkout. Bought these as a gift for my sister-in-law. She has long wavy hair and needs earrings that stand out and these do. They are gorgeous coin pearls. Beautiful sterling silver earrings. Even though they look like they should be worn to a wedding, I wear them nearly every day to go shopping, book hunting, coffee shop perusing. Great everyday earrings. I'm going to a wedding a wanted a bracelet to go with my dress. I saw this bracelet and loved it, but wanted some purple in it. Kim replaced the turquoise teardrops with amethyst teardrops and it's gorgeous. The stones are high quality and the workmanship is excellent. She also shipped it to me quickly. I highly recommend her jewelry! Please make payment within 3 days of your order. We accept Paypal, personal checks and money orders. Items will be shipped out after personal checks or money orders have been deposited and cleared. This may take up to 10 days. Items paid via Paypal will be shipped out within 2-3 business days. Please note, NJ residents will be charged 7.0% sales tax at checkout. If you are not satisfied with our jewelry, you may return it in its original packaging and condition for a full refund minus shipping within 10 days of receipt. Please notify us via email prior to any return of the item. All items are shipped via USPS First Class. Insurance is not included, but is recommended. If you would like your package insured, please contact me so that we can send you a revised invoice reflecting the insurance charge. All items are shipped within 2-3 days of purchase. Custom orders are absolutely welcome. We do require a 50% non-refundable deposit on all custom orders. Please email us to inquire further. Wholesale orders to licensed retail businesses are welcome. Please contact us at kimnguyen@kimiadesigns.com to inquire further about wholesale terms.